Tensions between the two nations have been high for months. (CNN) -- An unmanned spy plane launched from Colombia violated Venezuelan airspace last week, Venezuelan President Hugo Chavez said Sunday. The army has been ordered to shoot down any further incursions, he said on his weekly television and radio show. Chavez said the aircraft quickly disappeared after flying near a military base in the western state of Zulia, on the border with Colombia. Tensions between Colombia and Venezuela have been high for months over accusations by both sides of attempts to destabilize each other. Colombia has accused Chavez's government of aiding leftist guerrilla groups that fight in Colombia. Chavez, meanwhile, has strongly objected to an agreement between Colombia and the United States to allow American troops to train at Colombian bases. Chavez did not say who is suspected of launching the spy plane, but he said that such planes are "technology of the empire," referring to the United States. 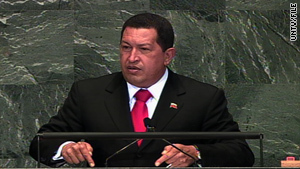 "We will not fall for provocations, but, of course, we are on alert," Chavez said. Colombian and American authorities did not immediately respond to the allegation.